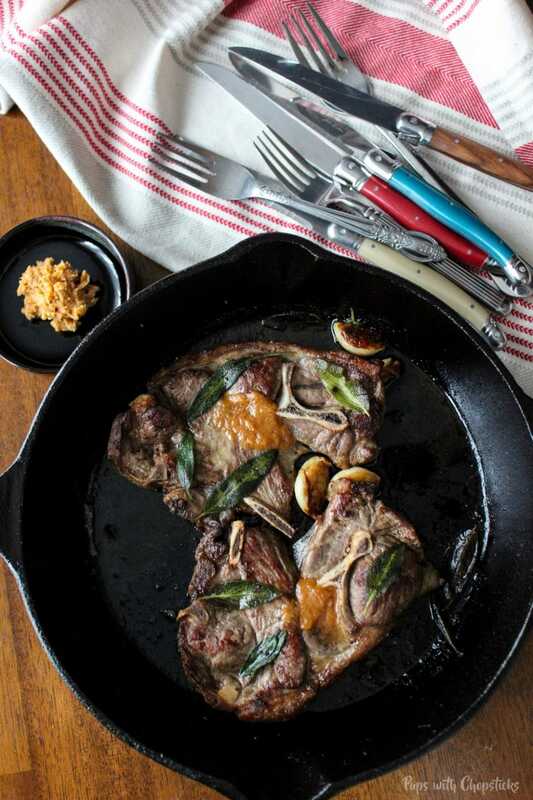 Who needs a grill for lamb chops when you have a searing hot skillet? This winter, don’t be sad that your BBQ is out of commission – embrace it and pick up that skillet for a pan fried lamb chops instead! The melted miso butter will be SO worth it. I promise. One of the greatest joys in the summertime for me is firing up the BBQ and grilling up a steak, or..in my case lamb chops. Winter or not, being the stubborn person that I am, I refuse to give up a good lamb chop. Especially if it only takes 5 ingredients, quick to make and very simple to put together. 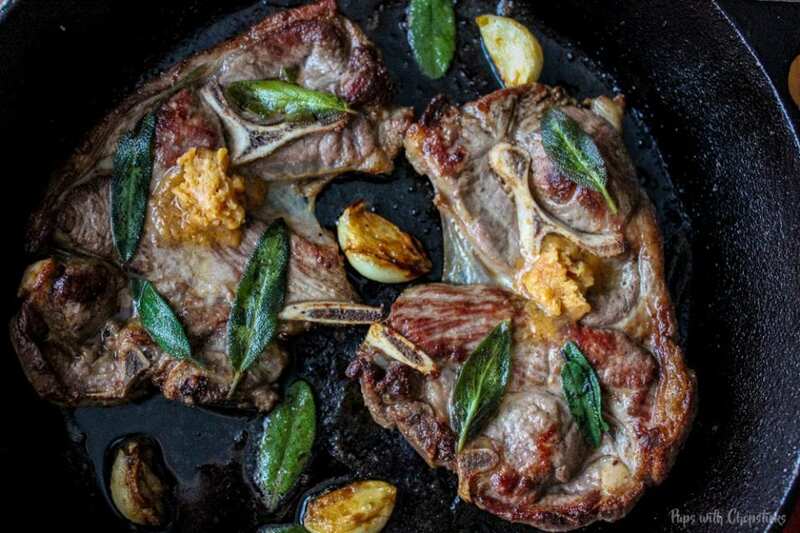 A juicy pan-fried lamb chops dinner on the table in 15 mins. I love that! More time for me to dilly dally around! 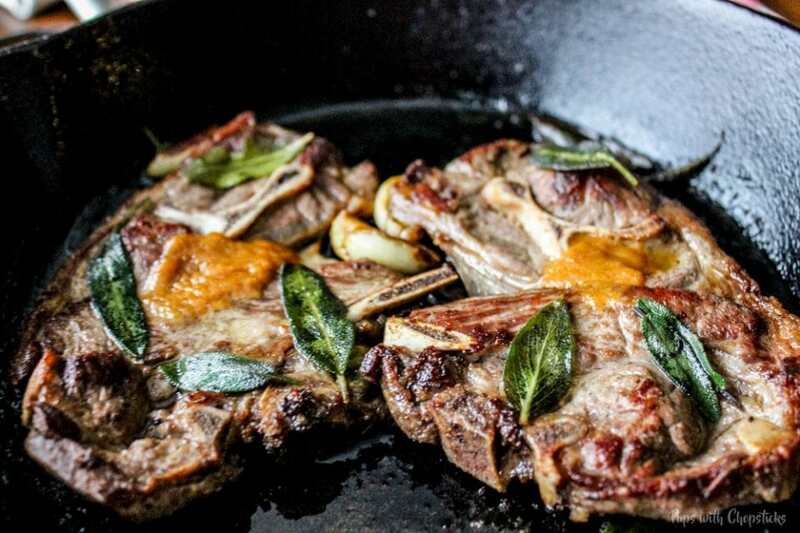 This pan-fried lamb chops dish is absolutely fantastic. What made this dish fantastic was the miso butter and sage. When you brown the sage and garlic up in the butter, the lamb chops get infused with those flavors. When you top it off with the miso butter, it really completes the flavor with a nice salty umami flavor. Tip #1: Normally I would suggest you salt the meat before you put it in the pan to give it a nice crust but in this case, the miso butter has enough salt to flavor this dish. 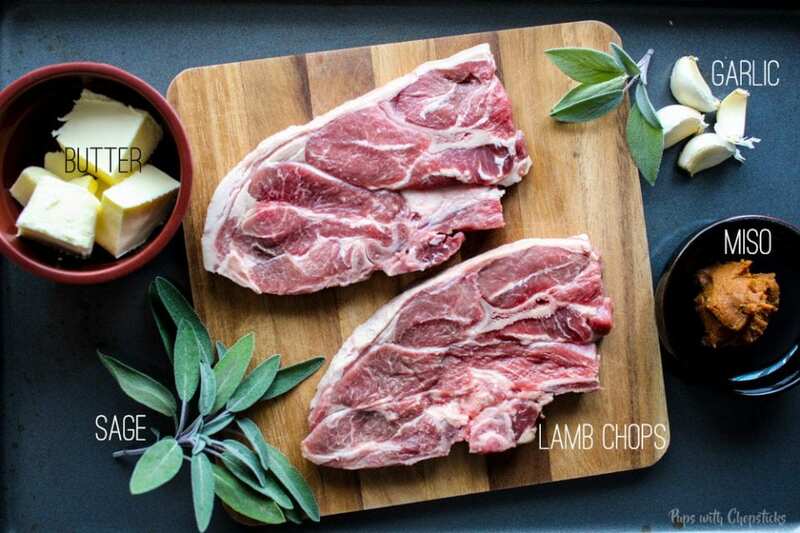 For this pan-fried lamb chops recipe, you should be able to find all of these ingredients from your local grocery store. Miso might be trickier to find depending on where you live, we get ours at the local Asian supermarket. I take no credit here for this wonderful creation. 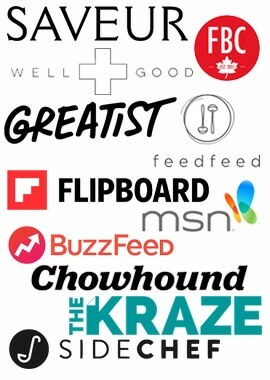 This is all Mr. David Chang from Momofuku. I’m wondering how I ever went without this for so long. It is really easy to make. Leave some butter out to soften and then mix the miso in. That’s it. The ratio he uses is 2:1, butter to miso. Update: I have been asked what type of miso I used for this recipe so I decided to do an update to the post. I used red miso paste because I like a strong miso flavor but you can use any type of miso for this. Toast. Okay I lie, not toast 😛 Almost anything! When you are cooking with ingredients like butter, herbs, and garlic on high heat you need to be careful not to burn them. To prevent burning the butter during the initial heating stage I add oil first, then I add the butter. The milk solids in the butter on direct heat tends to burn quickly, but when added with oil it seems to slow down the burning process. We want to wait until the pan is REALLY hot. When it’s ready, then we put the chops on to start the browning. I prefer to not put the herbs and garlic right away. I know we want to infuse the oil but I find when these delicate ingredients go in too soon, they burn really quickly. Especially when you are working with such high heats. After about 2 mins, that is when I add in the garlic and sage, and usually, that is about the time I will also check if the meat is ready for flipping. I lift it up slightly on one side, if I see a nice browning, then it’s ready to be flipped over. If it still looks gray and sad, then I leave it for another minute or so. After you flip it, cook it for another few minutes you’re ready to plate it. Tip #2: Try not to flip the meat too much. Flipping the meat less often allows browning and the crust to form on the meat. Trust your nose! 🙂 If you smell burning, you should probably flip it. Don’t forget about that oh so yummy miso butter! 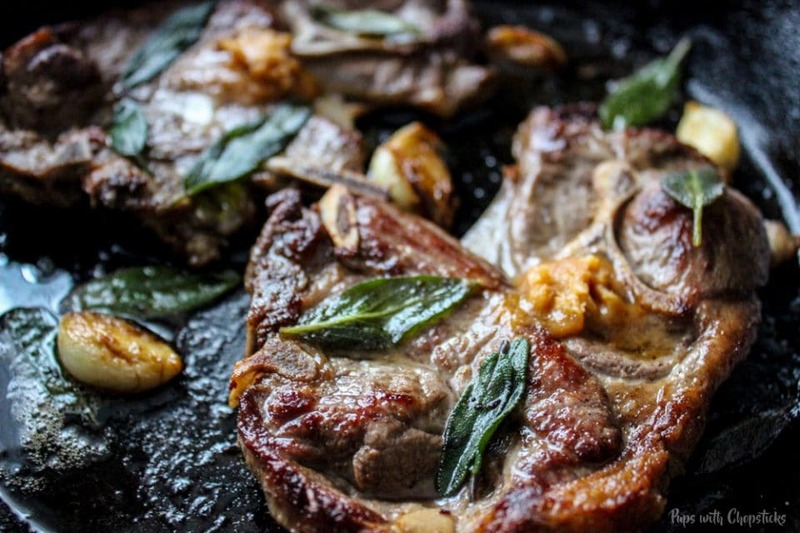 At this point, I’d throw a chunk on and let it melt all over the pan-fried lamb chops and then eat! Om nom nom nom. 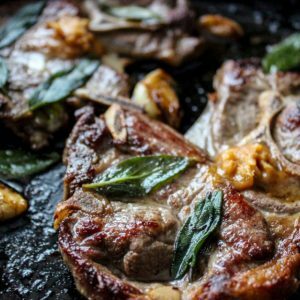 A quick and easy recipe for pan fried lamb chops topped with melted miso butter that’s satisfying and full of umami flavors! To fancy it up, you can also saran wrap and roll it into a log before putting it back into the fridge and when you are ready to use it remove it from the saran wrap and slice it into medallions. Add a bit of oil and butter in the pan. When the butter has melted and the pan is hot, add the lamb chops and sear for 2-3 mins on one side. Do not add salt to the lamb chops when you are cooking it. The miso butter has enough salt in it to add the savory flavor at the end. To get a brown crust on the lamb chops, flip it only a once or twice. The long exposure to the heat is what allows the crust to form on the lamb. WOW! Miso Butter!? Sounds incredible!! Gorgeous photography too! Oh wow that looks simply gorgeous! My ideal meal! This came just in time! I just bought some pork chops and was trying to decide how to prepare them. Can’t wait to try this miso butter! …now if I could only reach that tub of miso at the back of the fridge! Ahhh! I feel so happy that I inspired you! 🙂 <3 This give me a bit of a giggle because it's the exact same way in my fridge! My miso is always a tough one to find let alone reach at the back of the fridge haha! But oh my gosh! Yeeees! What a awesome way to jazz up portobello! I must try that as well! Sage, garlic and miso butter. Sounds awesome. I’m a David Chang fan myself. One question – what kind of miso are you using? There’s many types at my Asian market. For this recipe I used the red miso, so the flavour is a bit stronger, but I think any kind of miso will work with this butter. 🙂 Let me know if you try this out!